News media reported that Turkish prosecutors have dismissed charges in a major corruption case that has shaken Turkey. Meanwhile the prosecutors who initiated the corruption probe are themselves now subject to an investigation. Today’s events raise basic questions about what remains of judicial impartiality in Turkey. Turkish prosecutors dismissed a case against 60 suspects, among them a former minister’s son and a construction tycoon, in the graft scandal swirling around Prime Minister Tayyip Erdogan’s inner circle, media said on Friday. The case, concerning the alleged award of illegal permits in building projects, was the less important of two dossiers in the scandal, which broke into the open on December 17 when three ministers’ sons and businessmen were detained in police raids. The country’s Supreme Board of Judges and Prosecutors… started a probe against prosecutors Zekeriya Oz, Celal Kara and Muammer Akkas, who were initially in charge of the graft case, as well as judge Suleyman Karacol, who had ordered a freeze on assets of the suspects. For many, the case reinforces a sense that judicial independence, always weak in Turkey, is being erased as the government extends its control. The corruption case has long been seen as an important test case for the judiciary’s independence and impartiality – issues that go to the heart of the rule of law. Whatever the merits of the cases, this sudden turn of events raises important questions about the politicization of the judiciary in Turkey. Gardner also argued that the HSYK bill represents “a much more long-term problem” of the Turkish judiciary. He said the judiciary has been used to prosecute the expression of peaceful ideas “unfairly,” and yet it remains ineffective against alleged wrongdoing, “be it allegations of corruption or human rights abuses” by public officials. “Unfortunately, it seems with these recent changes [to the HSYK], it is going to be even less effective in bringing these abuses by public official to account,” he added, stating what he called AI’s assessment that the changes to the HSYK “very clearly” damage the independence of the judiciary. 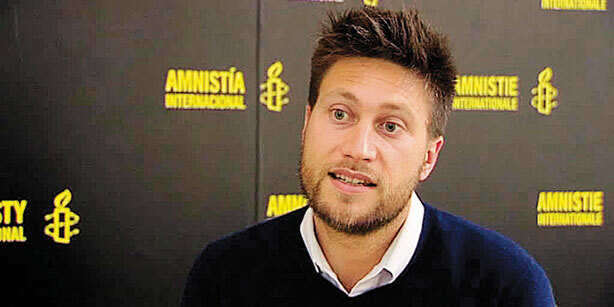 This entry was posted in Amnesty International, Andrew Gardner, Erdogan, Turkey, Uncategorized and tagged AKP, Amnesty, Andrew Gardner, Corruption, corruption case, HSYK, impartiality, impunity, Judicial Independence, Prime Minister Tayyip Erdogan, Supreme Board of Judges, Turkey. Bookmark the permalink.